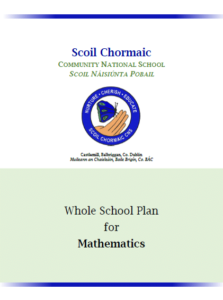 This page contains information for parents on how we teach mathematics in Scoil Chormaic CNS. It has been created to support parents in helping their children when learning maths at home. It draws on the whole school plan for mathematics, which can be accessed by clicking below. You can also see our School Self-Evaluation Report or School Improvement Plan. Where can I learn more about how maths is taught in Scoil Chormaic CNS? – Download our Whole School Plan, above, or read some of the guides provided in the questions below. – Attend Parent Information Sessions at the start of each school year. – Talk to your child’s classroom teacher at parent teacher meetings or by making an appointment through the office. What maths language will my child learn? How will I help them use it? We have laid out clearly in two guides, what language your child will learn as they go through school. This first document looks at adding, subtracting, multiplying and dividing. Click here. The other looks at other parts of the maths curriculum. Click here. – Explain what they are doing in school or for homework. How did they get an answer? What steps did they follow? Can they think of another way of explaining it? Could they have done the question in a different way? Could they draw a picture to show it? Check to see that they are using the maths language accurately. Do they know what the words mean? Where can I learn more about the national curriculum for mathematics? Who decides when my child starts to learn multiplication or another part of maths? What we teach at each class level, in maths, is laid out in the national Primary School Curriculum. For example, multiplication is not taught until Third Class, as that is what the national curriculum sets out. The National Council for Curriculum and Assessment has made some tip sheets for parents, available here. How can I help my children to talk about maths, and use maths everyday? – Have a positive attitude towards maths. Don’t let your child think that it’s expected or ‘ok’ not to be good at maths. Try to avoid remarks like ‘I was never any good at maths’ or ‘We always had trouble with maths’. Children should be encouraged to see the importance and value of maths, and come to their own conclusions about it. – Use maths in the shop – talk about and use money, the weight of food, bargains, etc. – Look for shapes, patterns, angles in your house and environment. – Encourage your child to use their Math Eyes (more info). What maths can they see in everyday ordinary objects? – Use the clock! Encourage your child to tell the time using an analogue and digital clock. Encourage them to be independent in knowing what time to do things (e.g. what time to eat dinner, what time they need to leave for school). Ask your children questions about the length of programmes on TV, how long it will be until the next one starts etc. How do children learn maths in the infant classes? We use a programme called ‘Ready, Set, Go Maths’. Children learn maths by doing and talking. Children learn to sort objects according to their properties (e.g. all the red cars, all the yellow cars, the shapes that will roll, the shapes that will not roll). They then go on to learn about combining, when children will bring small sets of objects together and see how many there are altogether. They then learn about partitioning which involves breaking a set of objects into smaller sets (subsets). Children will revise these topics in Senior Infants, using larger numbers. They will also begin to learn subtraction. Please see this document for more information on the language children will learn in infants (see first two columns). I think that the way my child is learning subtraction (or addition/multiplication/division) is different to how I learned it. Where can I learn more? This guide provides clear step-by-step instructions on how we talk about and do addition, subtraction, multiplication and division in Scoil Chormaic CNS. What tables should my child know? Are tables important? In Scoil Chormaic CNS we recognise that children need to understand their maths work before learning it off by heart. However, children, as they move through the classes, must be able to quickly and easily recall addition, subtraction, multiplication and division facts. Not knowing their tables will slow them down when they need to do more complicated work. Teachers will often give tables tests to see how your child is doing with their tables. This guide tells you what tables children will learn in different classes, and how they might ‘say’ them. English is not my first language. How can I help my child with maths? Research on how children learn maths tells us that what they know in their first language can transfer into their second. If they understand how addition works in Polish, for example, all they need in their second language (English) is the new words to describe what they are doing. Talking about maths in their first language will help them. The children will learn the language of maths in English in school, and you can ask them to practice using it at home. A guide to some of the language is available here for addition, subtraction, multiplication and division, and here for other aspects of maths. What new maths will my child learn apart from number work? See this guide for information on other new concepts and vocabulary your child will learn in different classes. How should my child write numbers? We learn to write numbers in the following way in Scoil Chormaic CNS. However, we know that children need to be able to recognise all of the major ways of writing numbers. How can I learn more about how my child is getting on in maths? – Most classes will have a maths test/assessment once a term. When your child’s teacher sends home this test, you will see areas in which they are doing well, or may need more practice. – Standardised tests- reported through end of year reports (June). We use the SIGMA-T in Scoil Chormaic CNS. See here for information on what standardised tests results mean. – Ask your child about what they are learning in maths. Ask them to look for examples in their everyday life. How are textbooks used in Scoil Chormaic CNS? What textbook do we use? In Scoil Chormaic CNS, we use our textbook (Planet Maths) as a resource. This means that when teachers teach maths, they use the textbooks some of the time to give children time to practice what they have learned. A textbook will not teach maths. In Scoil Chormaic CNS we believe that learning maths should be practical and hands- on. For that reason, most of the time our learn in maths will involve using concrete materials like counters or lollipop sticks, working with others in groups. We will not always finish the whole Planet Maths book before June. This does not mean that we did not teach the whole curriculum. In fact, it probably means that the children have spent more time learning maths in a more hands-on way.